The plastics pipe sector in Europe was severely affected by the Great Recession and the ensuing eurozone economic crisis, according to a new report from Applied Market Information (AMI). 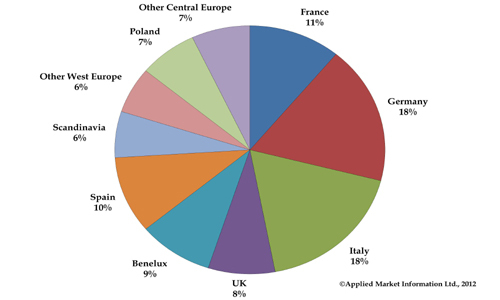 AMI offers a comprehensive listing of Europe’s 480+ pipe extrusion sites across Europe. The extent of the attrition that has occurred in the region is illustrated by the fact that in 2008 the same report listed 559 sites and in 2001 there were 625 manufacturing sites in operation. The worst affected markets have been Spain, Italy, France and the UK which accounted for 60-70% of the site reduction in Europe. The most common reason for plant closures has been either group rationalization within a country or the transfer of production abroad, although there have also been many bankruptcies and acquisitions resulting from liquidation. The crisis accelerated the trend for the merger of production sites which had begun earlier as a result of a slowdown in construction in the period 2001-2005, largely caused by the depressed state of the German building market at that time. That said, Germany is still the largest producer of plastic pipes accounting for 20% of production in 2014, AMI’s study showed. Its share of production has in fact increased over recent years as it is the only Western Europe country which has seen output recover to 2007 levels of demand. Overall European production of plastics pipes in 2014 is still 20% below that of 2007. The largest producer, both in volume and turnover in Europe is Wavin, AMI stated. In 2012 it was acquired by Mexichem and is now part of a group which is the largest pipe producer in the world. Following the takeover eight facilities have been closed, including plants in Belgium and Norway with manufacturing moved to more competitive locations including Latin America. Corporate strategy is to continue restructuring the business to further improve its competitive position and profitability. Pipelife is Europe’s second largest producer and like Wavin it too saw a change of ownership in 2012 when Solvay sold its share in the business to its Joint Venture partner Wienerberger. Despite the downturn Pipelife has continued to make acquisitions including the Swedish sewage, soil, water and cable protection pipe maker Westpipe in 2010 and Alphacan’s polyvinyl chloride (PVC) pipe plant in Gaillon, France during 2011. Likely to be challenging Wavin and Pipelife for the position as Europe’s largest pipes producer in the future is Russia’s Polyplastic Group, currently the third largest producer in volume terms. Since it was founded in 1991 it has expanded rapidly through investing in new plants and acquiring other sites. In 2013 it entered the Western European market through its acquisition of Radius Systems in the UK which had previously been part of Uponor. It went on in April 2014 to acquire Evopipes in Latvia and create a Joint Venture in with KE Kelit in Austria for supplying piping systems for district heating. The group’s strategy is to achieve production output of 500,000 tons/year by 2020. Pipe production in Europe is quite consolidated with the top 10 companies accounting for 40% of production by volume. An analysis of the financial performance of the 50 companies listed in this report reveals an industry worth approximately €7.5 billion. Interestingly, despite the impact of the crisis in the eurozone, weak investment and low economic growth, the report pointed out that profitability for the sector has been remarkably consistent over the past five years averaging around 5-6%.